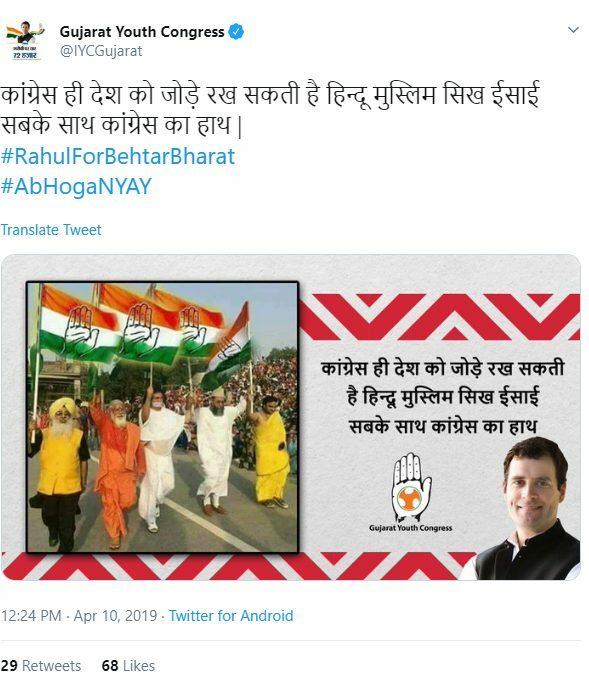 Gujarat Youth Congress tweeted an image showing religious leaders from five different religions holding the Indian National Congress flag with a message, “कांग्रेस ही देश को जोड़े रख सकती है हिन्दू मुस्लिम सिख ईसाई सबके साथ कांग्रेस का हाथ | (Only Congress can unite the Country. Congress is with everyone – Hindus, Muslims, Sikhs and Christians -translated)”. This was an attempt to convey that only Congress can unite people from different religious identities together. This image was also posted on the official Facebook page of Gujarat Youth Congress. A Facebook page, 60 years of Congress had also posted this image with an identical text on April 5. Alt News found that the image, which has the religious leaders holding the INC flag, is photoshopped. In the original image, the religious leaders were seen holding the Indian National flag and NOT the INC flag. The picture was clicked at Wagah Border, Amritsar in 2016 where interfaith saints including Swami Dipankar, Acharya Lokesh Muni, Sushil Goswami, Dr Imam Ilyasi and Paramjit Singh Chandhok were seen marching on the Wagah border with the Indian National flag. Earlier, the same image was photoshopped with Samajwadi party’s flag and Swami Dipankar had called it out on Twitter.